I wrote a post back in 2012 about this relic from a long-closed amusement park on Milwaukee’s northwest side. 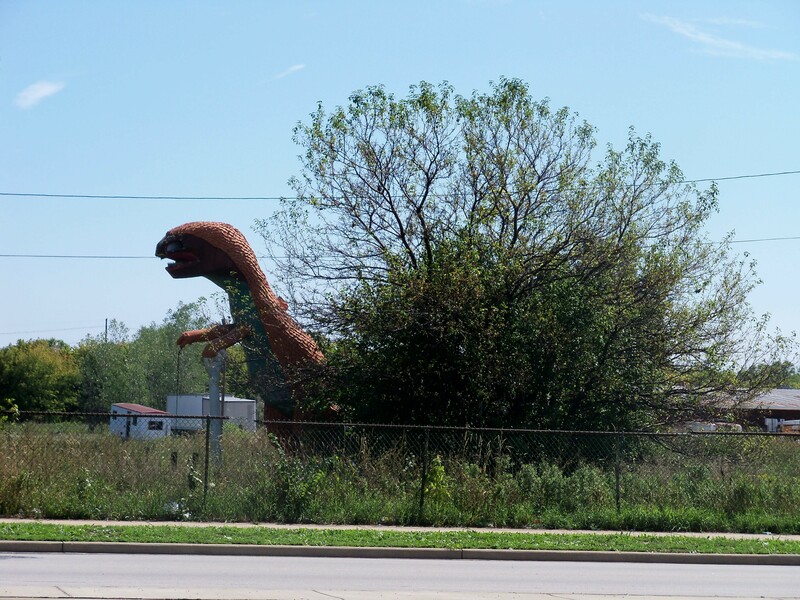 The dinosaur has been a familiar fixture on North 76th Street in Milwaukee for at least 40 years, and for the past five years my post has prompted many comments from people sharing memories of Johnson’s Park. For many who grew up in Milwaukee, this guy signifies specific and meaningful times in their lives. Well, sadly, our dino friend is finally gone. The Milwaukee Journal Sentinel ran a story on his fate in Sunday’s paper (link here to the article). Purchased for $11 at auction in December, the dinosaur will soon take up residence in the backyard of a home in Saukville, a town about an hour north of Milwaukee. The buyer has a personal connection to the dinosaur. As a child he played mini-golf and raced go-karts at Johnson’s Park, and as an adult he has worked at the various car dealerships that populate the neighborhood. This entry was posted in Life, Milwaukee and tagged Johnson's Park, kitsch, Milwaukee, mini-golf course dinosaur, roadside attraction. Bookmark the permalink. I’m glad it did not end up in a dump, but found a nice home. I would like to have something like that in my yard.